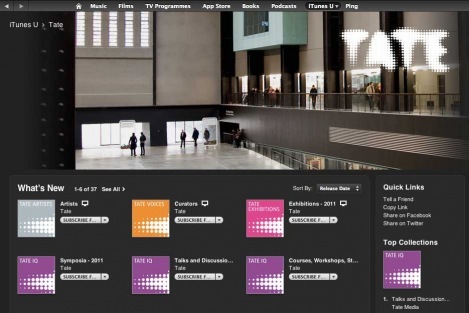 Tate offers a range of audio and video podcasts, including audio tours, interviews and recordings of talks and discussions. You may download the podcasts to your computer using special software and transfer them to a portable audio player. TateShots presents a weekly short video with a focus on modern and contemporary art at Tate. This podcast presents highlights from Tate’s wide-ranging programme of talks, symposiums and live events at all four Tate galleries. iTunes U is an education-focused part of the iTunes Store offering hundreds of video and audio downloads for free.